Norwegian Tippeligaen club FK Haugesund have qualified for the third round of the Cup after a 6-0 hammering of city rivals Vard Haugesund at the Haugesund Stadion on Wednesday evening. By the end of the first half, the game had ended as a contest as FKH were 3-0 up courtesy of a brace from their Nigerian striker Ibrahim Shuaibu and Filip Kiss's effort on 24 minutes. Shuaibu took his tally to five goals in all competitions in the process, having netted three times in the Tippeligaen. Manager Horneland had an eye on the league match with Sarpsborg 08 on Sunday and substituted the ex-Giwa striker in the 70th minute, while Gent loanee Ikedi Anthony worked a full shift. 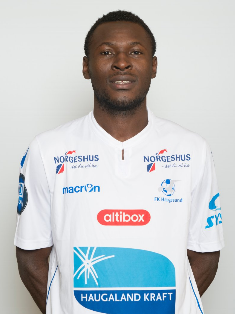 Elsewhere, Onyekachi Ugwuadu closed the scoring in Bodoe/Glimt's 3-1 win over Sortland IL, netting in the 87th minute to double his team's advantage.